I save a lot of these Scripture and quote images to a screensaver file that flashes them across my monitor every few seconds. This one comes up often and reminds me that life is precious, the days are short and everything I do should have meaning. Some days I hate to see it! Usually because I am wasting time. I’m wasting the day. I’m wasting the energy the Lord has given me to accomplish the greater thing (John 14:12). 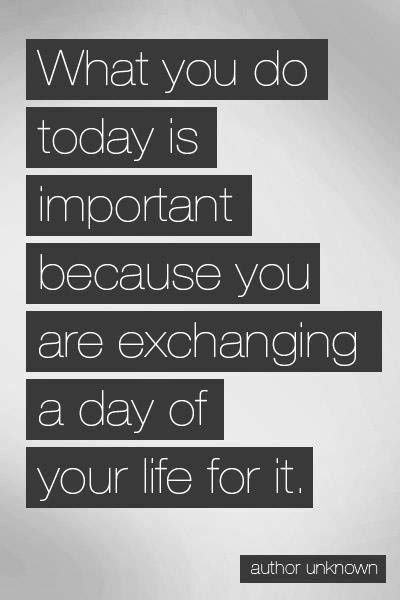 So, how will you and I recover our time from waste today? As we go through The 7 Experiment, what changes will we make to buy back time and use it for good purposes, God’s purposes? Who will we touch today with the love of God because instead of frittering away an hour doing whatever it is we fritter at we reached out, we gave, we served. Isn’t this the reason we are waging mutiny? It’s not just to get organized and out from under the enormous pressure and tyranny of excess in our lives, as great as that is going to be. But, it is to free us up to show mercy, do justice and walk humbly before the Lord (Micah 6:8). Isn’t this the reason Jesus came? To touch lives, heal hearts, mend brokenness? He left and He left us here to complete the work. To pray and work to see God’s Kingdom come, His will done, on earth, as it is in heaven (Matthew 6:10), not for us to build our own little mini-kingdom and see that our will and wishes are fulfilled. Take back the day, call a grieving friend, cook a meal for a family with a new baby, pray for that neighbor who drives you bonkers. However and wherever God leads, go, do, love, serve. Ask the Lord to show how you fit into His plan to bring His kingdom to earth. Just one day away from our first meeting and I can’t wait. My click pencil and pink highlighter are jumping up and down on my desk tempting to me to pop the cover and get started. Whoa, little writing implements, your time will come! It’s not too late to join the home or online group. Contact me here, on Facebook or by email at abiding@cfl.rr.com. Got this at Precept Austin’s blog. It has been gratifying this week to see that there are ladies who are willing to take on The 7 Experiment challenge and boldly declare mutiny on the excess in our lives in the areas of food, clothing, possessions, media, waste, spending, and stress. Each discussion I’ve had has revealed that we are all in pretty much the same boat. There is excess in some or all areas of our lives and it is causing anxiety, guilt and stress. We want to change but motivation, discipline and encouragement are lacking. We want to put some space around our “stuff”, we want, as Jen says, “to create space for the Holy Spirit to move”, we want to see God move in a mighty way in our lives. Come on! Jump in with both feet. The Lord has amazing things in store for you. Promise! Get more info about the study at here. Sign-up by contacting me at abiding@cfl.rr.com or register at alomachurch.org. Or, you can use the contact form below. Some ways that this verse is translated. Some wise words concerning this verse. 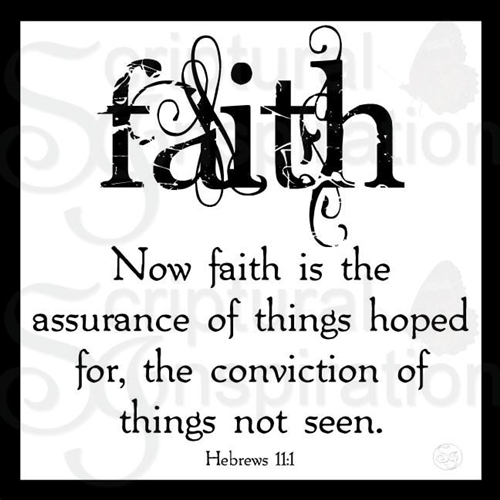 This is not a definition of faith but a description of what faith does and how it works. True Bible faith is not blind optimism or a manufactured “hope-so” feeling. Neither is it an intellectual assent to a doctrine. It is certainly not believing in spite of evidence! That would be superstition. Read that last sentence again and let it soak into your mind and heart. How to Hear a Word from God: The Letter to the Hebrews begins off reminding us of a stunning and remarkable fact – God spoke. And not only has God spoken, but he has done so “at many times, and in many ways.” And in these last days, he has spoken by a new and infinitely greater way of speaking. He has spoken by His Son. Have you heard this Word from God? Now, you might have read this Word, but how often – if at all – have you heard it? My Bible: Read the Bible from anywhere on your computer or mobile device. Beautiful design and inspiring illustrations accompany your reading. Follow your friends Bible reading. My Bible has tools that make Bible reading easy and fun. Includes Bible reading plans, with multiple translations and Facebook covers. The Essential Words of Charles Spurgeon on sale at Amazon. God’s Name for the Impossible Moments in Life: The names of God reveal the character of God. And, knowing the character of God brings comfort to the hurting, healing to the broken, peace to the anxious, and confidence to the fearful. Contact me if you need more information or would like to register. Only a Breathe Sharing the hope of life in Christ and the joy of His unfailing love. Lightsource Great place to find video podcasts. OnePlace Great place to find audio podcasts. Wordle.net Fun with words. You have to check it out!